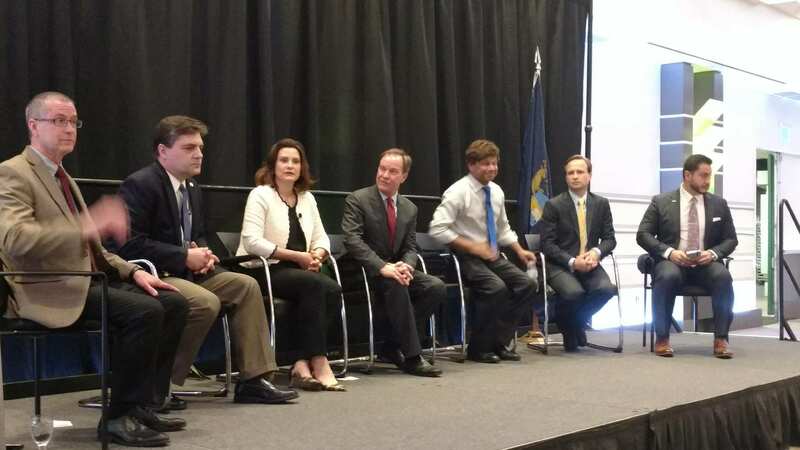 From left to right: Jim Hines (R), Patrick Colbeck (R), Gretchen Whitmer (D), Bill Schuette (R), Shri Thanedar (D), Brian Calley (R), and Abdul El-Sayed (D) share a stage at the Michigan Press Association governor candidate forum in East Lansing, Michigan, on May 10, 2018. All seven Democracts and Republicans in Michigan's 2018 governor race sat together, addressed each other, answered questions in an extrodinary candidate forum Thursday at a Michigan Press Association conference in East Lansing. Candidates in attendance included Jim Hines (R), Patrick Colbeck (R), Gretchen Whitmer (D), Bill Schuette (R), Shri Thanedar (D), Brian Calley (R), and Abdul El-Sayed (D). Highlights of the fireworks at the conference from reporters. Colbeck getting into his claims about the Muslim Brotherhood trying to infiltrate the United States. Again names El-Sayed in this theory. Doesn't offer evidence. Complains about unfair media coverage of his claims. Big throwdown between Calley and Schuette on financial disclosure. Calley claims Schuette is moving some of his assets around contrary to blind trust claims, Schuette says false accusation, Calley's desperate. This will take some time to flyspeck. And why were the two Libertarian Party party primary candidates not included? Bill Gelineau and John Tatar are as likely to win as any of these folks, and both bring fresh ideas to the table. Republicans need to be punished for poisoning Flint and needlessly stripping Detroit of billions of dollars of assets. Yes Republicans -Snyder should answer how an Emergency Financial Manager duties balancing revenues and expenses migrated to implementing long tern capital investments, an entire new source for Flint's water system and management of flint's water utilities. None of was ever was part of their duties! How Republicans stripped Detroit of billions?? Please explain!!! Sounds like specious charge!